Iron Maiden are sharing a video preview of the final round of vinyl reissues set to arrive this spring. The band will release twelve albums from their catalogue on heavyweight 180g black over the next three months as part of an expanded reissue series that launched in 2014 with eight records. The 2017 editions wrap up on July 21 with 2005’s “Death On The Road” (Live), 2009’s “Flight 666” (Live), “The Final Frontier” (2010) and 2012’s “En Vivo!” (Live). 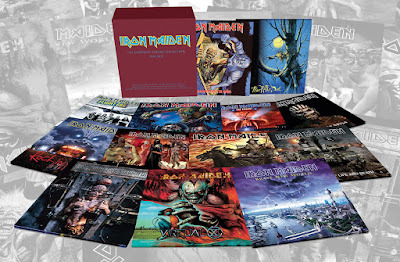 As a bonus, the first two albums (“No Prayer For The Dying” and “Fear Of The Dark”) will also be made available in an exclusive Collector’s Box sized to house all 12 albums with additional space for fans to insert the latest Maiden studio album “The Book Of Souls”, which was released on triple black vinyl in 2015. The Collector’s Box will be a strictly limited edition and available while stocks last. The 2017 releases will complete the group’s vinyl reissues series. Iron Maiden recently launched their 2017 dates in support of 2015’s “The Book Of Souls” in Antwerp, Belgium; the European run wraps up at the end of this month and will be followed by a North American trek that begins in Bristow, VA on June 3.